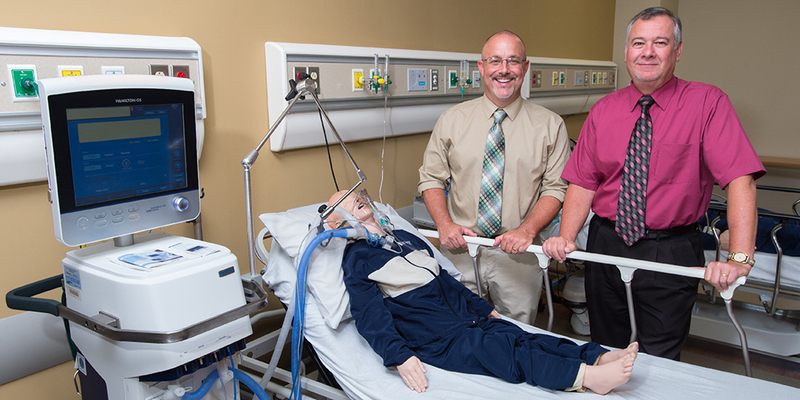 Tim King (left), Respiratory Therapy instructor at Edgecombe Community College, will take over as program chair of the Respiratory Therapy program when longtime chair Ralph Webb (right) retires on Friday, August 31. For 30 years, Ralph Webb has led the Respiratory Therapy program at Edgecombe Community College. Webb will retire on August 31, and longtime Respiratory Therapy instructor Tim King, who serves as director of clinical education, will take over as program chair. Webb’s departure comes on the heels of the national Commission on Accreditation for Respiratory Care (CoARC) granting of Continuing Accreditation to the AAS Degree Entry into Respiratory Care Professional Practice Program of Edgecombe Community College. The program met all 59 standards examined by the Commission. In addition, the program received the prestigious 2018 Distinguished Registered Respiratory Therapist (RRT) Credentialing Success Award at the American Association for Respiratory Care (AARC) Summer Forum in San Antonio, Texas. This award recognized in part the program’s three-year (2015-2017) 90+% passing rate for graduates obtaining the RRT credential. CoARC views the RRT credential as a measure of a program’s success in inspiring graduates to achieve their highest educational and professional goals. Webb began his career in respiratory therapy in 1978 at Wilson Memorial Hospital, leaving there in 1985 to head up the Cardiopulmonary Department at then-Heritage Hospital in Tarboro. In 1988, Eastern North Carolina’s choice for respiratory therapy education was at either Carteret Community College or Pitt Community College. Webb left Heritage to start a program at Edgecombe Community College to give area students a local option for training in the respiratory care field. In the program’s first year, the College accepted each student candidate who applied for the program. Thirteen students enrolled in that first class. Although the current class cap is 15 students, the program has grown dramatically in the past three decades. In some years, the College has seen up to 50 students apply for admission to the program. In addition to the accolades from the Commission of Accreditation for Respiratory Care, Webb said he’s also proud of the 100% job placement rate for Respiratory Therapy graduates over the years. “The graduate and employer surveys that are conducted as part of the ongoing accreditation process attest to the fact that exceptional program outcomes can become a reality when the College, adjunct clinical facilities, students, and faculty work together,” he explains. “Exciting days are ahead for those currently in the profession of respiratory care and for those considering such a career,” Webb says. “With advanced degree options currently existing and even greater educational opportunities in the making, this is a career worthy of consideration for any and all students who are willing to give it their all. In return, tremendous rewards await.